Buying a home is a big deal. A house is usually the biggest single financial investment of a person’s life. Investigating the condition of a building before you invest can get you a better deal on your purchase, as well as keep you from making an offer on something you would be better walking away from. The AC and heating systems should be a part of any home purchase inspection along with roof, foundation, plumbing, electrical and pest reports. Doing as much looking around as you can on your own will prepare you for better understanding problems that a professional inspector finds. You may also find problems yourself, and alert the inspector about things to look for. Take a paper and pen and carefully examine the central air conditioning system of each prospective house you visit. When you locate the home’s air conditioning system, look near the compressor for a yellow tag (pictured on right) that gives information about that particular air conditioner. Perhaps the most important piece of information on the Energy Guide tag is the system’s Seasonal Energy Efficiency Rating, or SEER score. The SEER number is in the middle of the tag and indicates the energy efficiency for that model. A lower number means lower efficiency and higher operating costs and electricity expenses. The Energy Guide tag makes it very easy to directly compare the efficiency of air conditioning systems against each other by depicting a sliding scale and where that particular model ranks in overal efficiency compared to other available options. This is a good thing to take note of when comparing houses to rent or own. 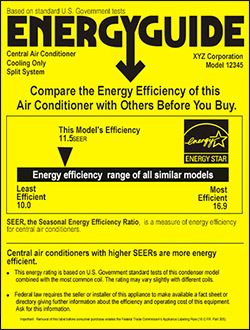 Most cental A/C models being manufactured now have a SEER score of 13 or more. SEER 15 to 17 and above are an indication of a very high efficiency model. The manufacturer and model number are also found on this tag in the upper right hand corner, and are important to note. Changes have occurred in what kinds of refrigerants can be used in AC systems. The older type of CFC, called R-22, is being phased out, and newer, ozone friendly R 410-A is replacing it. The model number can help determine what kind of refrigerant the system has in it. There is no problem continuing to use a system with R-22 for now. Manufacture of R-22 will continue until January 1, 2020 for maintaining existing models. The price for R-22 will continue going up, however, as it gets closer to being phased out. All new models now being built contain the new R 410-A gas. It is manufactured under a number of registered trademark names. The EPA has developed comprehensive list of EPA approved AC refrigerants available on their website for environmentally conscious consumers. If the AC system is leaking refrigerant, it will possibly leave an oil stain from compressor oil that leaked with it. The gas itself will evaporate and will not be visible. If the system lacks refrigerant, it will not cool properly, so be sure to check how well the AC cools the house. Water leaks are something else that you may find. AC systems take moisture out of the air and deposit it in a drain pan. Check this area for problems with clogged drains or other accumulation of moisture that could cause mold. A central air conditioner that needs replacement can cost between $2,000 to $5,000, not including the air ducts. Flexible ducts sometimes need to be replaced, especially if there are problems with mold. Ridged metal duct work can be cleaned, is less likely to have mold problems and is more durable. Replacement of duct work, along with cooling unit or heat pump, can increase the replacement cost to $10,000. 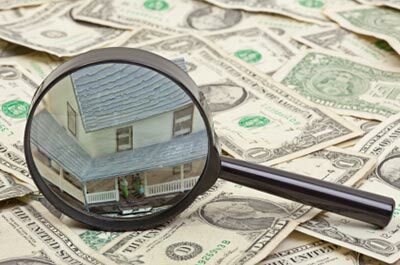 Having a professional home inspector look at the AC system, as well as the rest of the house, is well worth the money when buying an older home. The cost of an inspection is usually between $200 and $500. It is the buyer’s responsibility to have a house inspected during a sale, except for pest reports required of the seller. General contractors, as well as air conditioning repair contractors, have the expertise for examining the central air conditioning system in a house you are thinking about buying a new air conditioner.